This week I caught the attention of BBC dragon Theo Paphitis’s with this #SBS tweet. Winning #SBS has been brilliant. I’ve got the SBS badge on my website, a profile on Theo’s new SBS website, I’ve gained around 200 followers and had more hits than usual on my website. Tweet @TheoPaphitis about your business on Sunday night between 5-7:30 pm – remembering to include the #SBS. Read the winning tweets to see what catches Theo Paphitis’ attention. Aim to capture the essence of your business and write something that will stand out. Don’t give up! I know a lot of #SBS winners (including me) who entered for many months until they were chosen. And if you want to gain PR exposure from a winning tweet, ensure your tweet presents you and your business in a good light! After winning #SBS, I got the opportunity to gain coverage for Gem Writing in the local media. Marketing your business on a micro business budget can be a challenge. Fortunately there are cost effective ways like Twitter and face-to-face networking to get your word out. However, the publicity gained through media appearances can be invaluable. That’s because your story has been written by a journalist, and not you. In this way, PR is often more effective than paid advertising at helping you reach and gain the attention of your target market. A good press release has a headline that hooks, an inverted pyramid structure that leads with the most important information first, and quotes from a named person to give substance. I also added essential information about my business and listed some key projects I’ve done as well as adding my contact details. 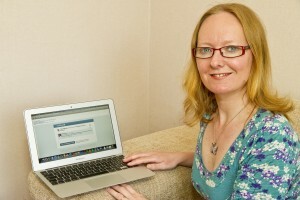 I then took a photo of me with my winning tweet and sent off with my press release. PR Lesson 1: Pictures are good for journalists but also your business. Having a picture published with your story makes it visually interesting and can help customers recognise you. When sending your image, remember to include a descriptive caption. My #sbs win was a local story so I searched the local paper’s website to track down a contact number for the news desk. I phoned the business editor and related my #sbs story, ensuring I focused on the most interesting bits first. I mentioning Theo, asked if they’d heard of #SBS, explained how the competition worked, told them I’d won and then explained what it meant to me. Needless to say, the involvement of such a high profile businessman in my story was an attractive angle and as a result I’m expecting my story to appear in the Plymouth Herald any day. Update: My story was published online at This Is Plymouth and in print on p.2 of the business section of The Plymouth Herald on Wednesday 23rd May. You can read it here. PR lesson 2: Find the most newsworthy angle of your story and lead with that. If it’s not interesting and it’s not news – don’t bother! PR Lesson 3: Journalists are incredibly busy so it’s worth trying to speak with them before sending your press release. That way you can gauge their reaction, and also ensure your press release is picked up when you email it through. Feeling spurred on by my success at the Herald I targeted the BBC Devon newsfeed. Again I found a contact number and spoke with the news desk. I had a very long conversation with the editor and answered lots of his questions. I felt hope when he said “congratulations”, and then disappointed when he followed up with “but I don’t think the story is quite right for our audience”. A little surprised I asked “Oh, isn’t this BBC Devon” to which he told me I was actually speaking to the main news desk at BBC Online (the big international office). Eek! PR Lesson 4: Think big! OK so I was a tad embarrassed when I realised who I was speaking with, but the lesson here is people are nice, regardless of their position. So talk to the people you meet about your business because you don’t know where it may lead. BBC online transferred me to BBC Radio Devon. 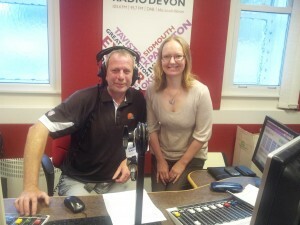 I was invited to speak on the Radio Devon show – Good Morning Plymouth the next day. Here I am with the lovely Gordon Sparks after my 6-minute interview. It was my first radio experience, and yes I was nervous but I’d most certainly do it again. PR lesson 5: Grab every PR opportunity that comes along. Talking about your business on the radio or TV is a great way to be seen as an authority and raise your profile. Even if it takes you out of your comfort zone. In fact, the actual experience is likely to be more fun than you imagined. Winning #SBS was a highlight for me and I couldn’t wait to celebrate by ordering a personalised mug from the fantastic Barry at LF Designs. 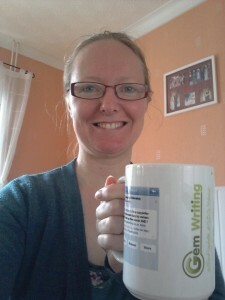 I was so impressed with the quality of my mug and the standard of service. I would definitely use Barry again and cannot recommend him enough. I’ve had a fantastic week in the #SBS spotlight, but I’ve also learned something about the importance of PR and how to get it working for you. Good luck to everyone who’s entering this Sunday and here’s to the fantastic Theo Paphitis for organising a competition that helps put hard working small businesses in the spotlight. Another excellent post Georgina, I hope you will flag it up on the sbs web site too. I didn’t manage to get any PR out of my win so many congratulations. BBC, radio and all! Thanks for your kind words Fiona. It was an exciting week and a great opportunity. I think I was lucky to be able gain some PR locally and I also learned a lot from my experience of talking with the media. Hello there! This article couldn’t be written any better! Looking at this post reminds me of my previous roommate! He continually kept preaching about this. I am going to forward this information to him. Fairly certain he’s going to have a great read. Thanks for sharing!